Don Roberts on the bench in his final year as the head coach in 1997. Former Gustavus Adolphus College men’s hockey coach Don Roberts has been recognized for his lengthy and outstanding service to college hockey by being named the 2009 recipient of the Hobey Baker Legends of Hockey Award. The award, presented by the Hobey Baker Memorial Award Foundation, will be presented to Roberts at the annual banquet on May 7 at 317 On Rice Park in St. Paul, Minn. He will be honored along with Matt Gilroy of Boston University, who is the 2009 Hobey Baker Award winner. The reception will begin at 5:30 p.m., with dinner and program from 7-9 p.m. Tickets for the banquet are available for purchase online at www.hobeybaker.com. Roberts coached Gustavus to a 532-290-25 record in a career that spanned 33 seasons (1964-1997) and he retired as the winningest coach in the history of Division III men’s hockey in 1997 with 532 victories. Roberts 532 wins rank 12th all-time in all divisions of collegiate hockey. Recognized as one of the most prominent coaches in college hockey history, Roberts served as the chairman of the board and president of the American Hockey Coaches Association (AHCA), as well as being a longtime member of the NCAA Rules and Hockey Advisory committees. Roberts received the John MacInnes Award from the AHCA for lifetime commitment to collegiate hockey in 1993. He was named MIAC Coach of the Year seven times (1973, 1975, 1976, 1984, 1990, 1991, and 1993) and in 1975 he was named the National Coach of the Year by both the AHCA and the NAIA. When Roberts was named the head hockey coach at Gustavus in 1964, he had not ever played or coached hockey before in his life. He had coached football and baseball in the Marines from 1957-59 and football, wrestling, and baseball at Gustavus from 1959-65. His first hockey team finished with a 1-14 record, however, the following year Roberts’ squad won the school’s first MIAC title and the Gusties went on to win 12 of the next 13 league titles. His team’s also had success at the national level where they finished at the top four at the National Association of Intercollegiate Athletics (NAIA) National Championships for ten consecutive years (1968-77). The Gusties finished second at the NAIA Championships three times — 1972, 1975, and 1977. After 1980, when Gustavus became a member of NCAA Division III, the Gusties played in the NCAA National Tournament seven times, including an appearance in the NCAA Frozen Four in 1982. During his career, Roberts coached 54 separate skaters, who earned all-conference honors at least once, as well as 28 players who were named to NAIA or AHCA All-America squads. He also coached Chuck Linnerooth, the first hockey player inducted into the NAIA Hall of Fame. 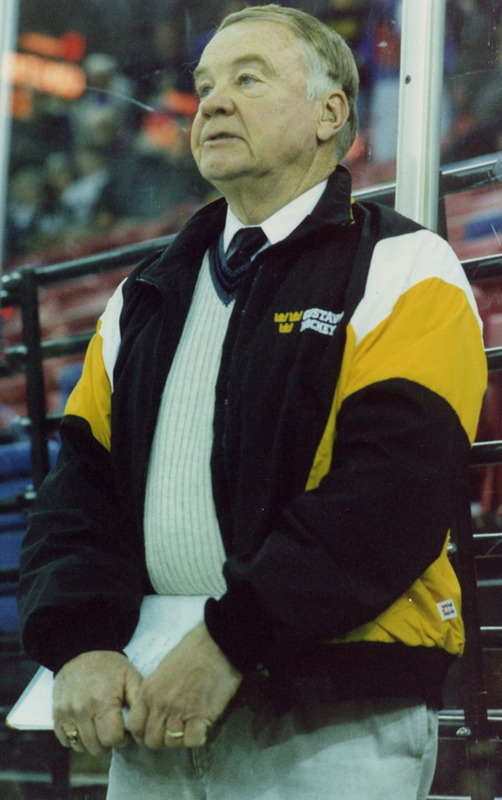 Roberts, a 1956 graduate of Gustavus, played a key role in the fundraising and construction of the school’s ice arena, which is also a multi-purpose facility that is used to host conventions as well as the College’s annual Nobel Conference. The Ice Arena was named in his honor in 1998. Don and his wife, Nancy, who live in St. Peter, are the parents of four children, Gregg, Tim, Mike, and Susan.